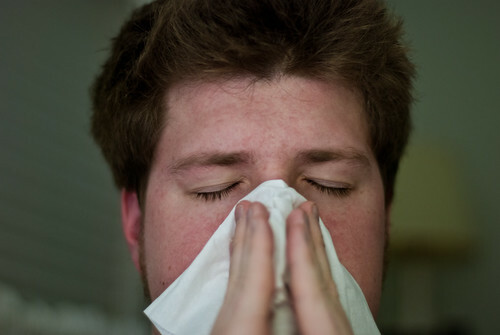 Cold and flu season have taken hold around the country, according to recent reports from the CDC. While you might not connect the cold and flu to your twice-a-year teeth cleaning, the Portland dentists and staff at South Waterfront Dental are concerned about each patient’s overall health. When you take good care of yourself, you are more likely to have healthy, strong teeth. Chances are good that if you haven’t yet gotten the flu, a family member or friend already has been down with it. Protect yourself with these tips! Daily habits effect overall health. Brushing your teeth twice a day lays a foundation for a strong, healthy smile. Flossing once a day helps to clean away plaque on a regular basis that might otherwise harm those hard-to-reach places of your teeth. The same goes for your overall health. Eating a balanced diet of whole foods can help keep your immune system strong. Drinking water throughout the day helps flush toxins from your body and serves as a natural way to rinse your mouth and gums after eating. Getting a full 8 hours of sleep is also essential to help fight cold and flu. If these steps don’t seem to be enough for keeping in good health, consider supplements that have been known to help. For example, echinacea helps fight off harmful bacteria and zinc improves the way white blood cells fend off infection. These supplements are easy to find and are fairly inexpensive. Talk with your doctor and your dentist about how supplements could work in partnership with diet and exercise for overall health. If you won’t see your doctor or dentist soon to ask about supplements, then it may be time to make an appointment. Seeing the doctor and dentist on a regular schedule helps provide these medical professionals with a solid baseline of your overall and oral health. Potential health and dental problems can be avoided before they even start, including the cold and flu, by simply following through with these important appointments. Flu shots are traditionally recommended for children and seniors as well as those who have compromised immune systems. However, it might be worth your while – especially if you work with people – to consider getting a flu shot. This is just one more way to protect yourself and your family members from the flu, decreasing the time away from your family, work and fun. It’s not too late to get a flu shot. Here’s a map to help you find out about the flu shot as well as what’s offered in your local community. 503-841-5658 to schedule your appointment.